This formidable warrior comes at you fast with sword and bow. 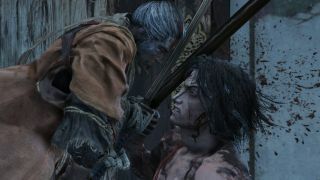 Genichiro Ashina is a boss from Sekiro: Shadows Die Twice located in the Upper Tower Ashina Dojo within the Ashina Castle area. You encounter him immediately after the Ashina Elite—Jinsuke Saze boss fight by climbing through the window and making your way up on to the roof. Genichiro Ashina has three lives and two forms that he will use during the course of the fight. You'll need to execute him twice in phase one and he'll gain his second form, 'Way of Tomoe' in phase two. You'll want to aim to take down his posture as he has a huge amount of health, so you'll need to be relatively offensive during this fight. He will also fire arrows at you if you try to get some room to regain health, so be careful. You'll encounter Genichiro Ashina in a fairly open area but you'll want to keep as close to him as possible to prevent him from using his bow. You can dodge or deflect most his attacks but you'll want to chip away at his health to make depleting his posture much easier. Using the Loaded Axe Prosthetic Tool is useful here as it deals a lot of posture damage. Bait him into an attack then deflect and counterattack as much as possible. It's possible to press Genichiro into a corner or up against one of the statues on the edge of the arena. From his position he will find it difficult to launch any of his jumping attacks without being struck down by your sword. Keep an eye out for two unblockable attacks when he jumps into the air. The first is a thrust attack and the second is a slashing attack. The latter is more common after you've depleted one of his lives. You can use the Mikiri Counter ability on the thrust, or simply dodge away if you're not confident enough to use it and want to play it safe. Genichiro also has a palm strike grab attack that's very easy to spot. Use the pause after this attack to heal if necessary, or punish him with the axe. If you learn the timing of his long nine-hit flurry combo you can deflect every blow for a good dose of posture damage. Once you've performed one execution on Genichiro Ashina, his move-set will remain the same, though look out for that unblockable slashing attack which will be more frequent now. Keep deflecting and countering until you can execute him for a second time. Genichiro Ashina keeps the same attacks as his previous versions but he's much stronger, has more range and has additional lightning attacks. If you see him jump into the air, he's either winding up a lightning attack or about to do one of his unblockable moves from the first phase. The charged lightning arrow can be deflected but it's safer if you can get behind him. His other lightning attack will cover an area of the floor, so either dodging away when it hits the ground or getting behind him should help avoid these. To deal the most damage quickly, you will want to redirect Genichiro's lightning attacks against him. The trick is to make sure you're struck by a lightning attack in mid air. In the window between being struck and landing on the floor, you can press the attack button to slash Genichiro with a lightning-infused blow. This does massive damage and stuns him. As Genichiro Ashina has removed most of his armour in this phase, his posture is much easier to deplete. Keep countering his normal attacks as you did in the first phase and stay on the offensive. If you can avoid his unblockable moves and lightning attacks, you'll take him down in no time.